Schizophrenia (SZ) and bipolar disorder (BD) are two related psychiatric conditions, together termed major psychosis. As with other complex genetic disease phenotypes, traditional etiological studies of major psychosis have focused primarily on the interplay between genetic (DNA sequence) and environmental risk factors. However, there are many epidemiological, clinical, and molecular peculiarities associated with these disorders that are hard to explain using DNA and environment-based mechanisms. Such observations have led to speculation about the potential importance of epigenetic factors in mediating susceptibility to major psychosis. Epigenetics refers to the heritable, but reversible, regulation of gene expression mediated principally through changes in DNA methylation and chromatin organization. In this chapter we reinterpret a series of epidemiological, clinical, and molecular findings in major psychosis within the framework of epigenetic dysregulation. 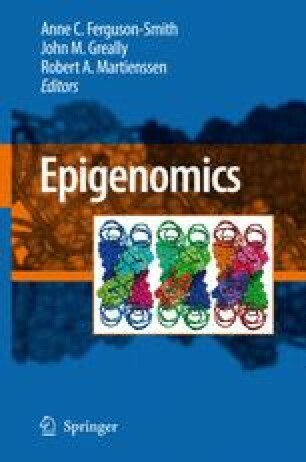 While epigenetics provides a new perspective on the aetiology of SZ and BD, it would be naíve to expect that applying epigenetic theory to molecular-based studies of psychopathology is a straightforward task that can be achieved without encountering a number of technological and methodological complexities. To date few empirical studies have been performed, but recent large scale epigenomic profiling has begun to highlight associations between specific epigenetic changes and risk for these disorders.